As Ben and Spider-Woman continue to battle the spider-mutated Alicia Masters, the two criminals searching for the long lost stolen treasure of World War II. They find the treasure they sought, however, when they open the treasure chest, they find themselves sucked into it by mystical forces. As the battle between Ben, Spider-Woman, and Alicia rages on, Ben smashes the control module on her forehead. Losing their ability to control Alicia thanks to this devices destruction, the Hydra agent in charge of this mission is ordered killed by the Supreme Hydra for his failure. 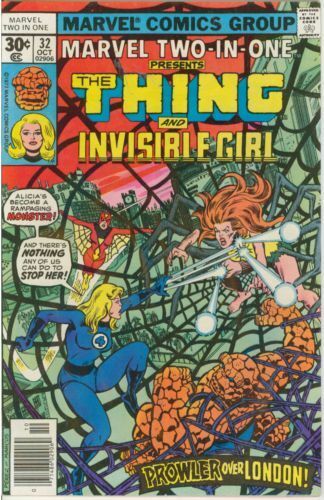 Alicia has the two heroes on the ropes until the Invisible Girl arrives. Using her invisible force fields, Sue manages to cut off Alicia's oxygen supply until she passes out. While Dr. Kort tries to restore Alicia back to normal, Thing wanders around London brooding. To make Ben feel worse, the people of London who originally treated him with celebrity when he first arrived are now treating him as a monster following the battle. Sue tracks down Ben and tells her that Alicia is calling out to him, and so they return to Kort's lab just as Alicia is being transformed back to normal.